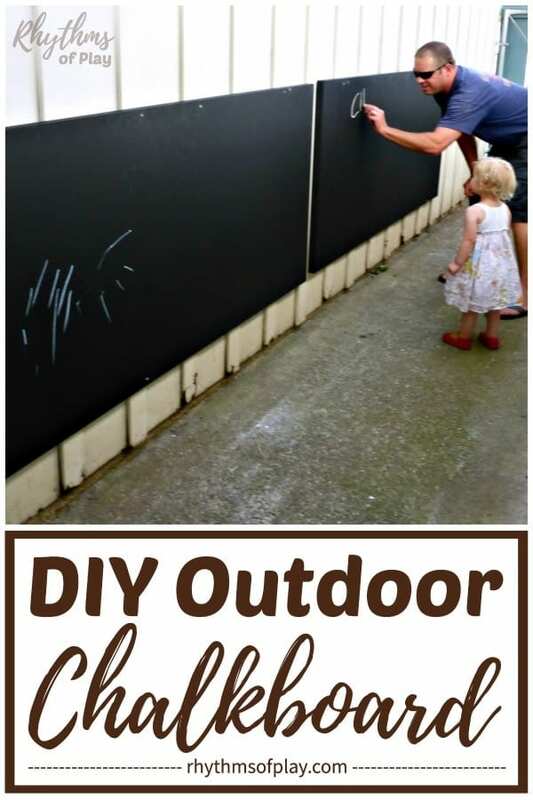 We hope you love this DIY outdoor chalkboard for kids. Below we share two super easy ways to make your own outside chalkboard for backyards and patios. 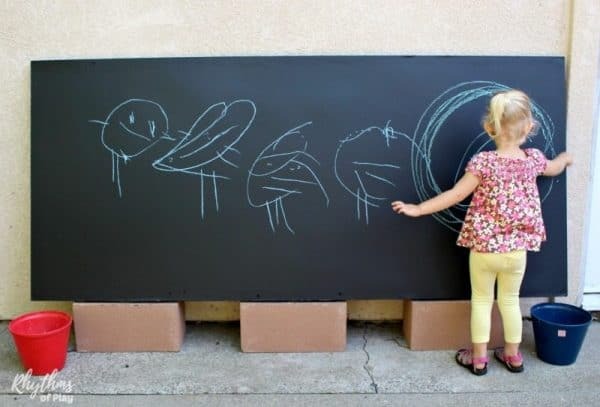 Backyard chalkboards are a great outdoor play area for children. Transform your backyard with a DIY Chalkboard! My husband and I used to run a daycare in our home on a one-acre lot. We created a lot of DIY outdoor play areas for the children in our care. One of the many play spaces that we created was a large outdoor chalkboard for backyards and patios. A couple of years later, we made another DIY outdoor chalkboard for kids when we moved to a new house where we had to come up with a new way to position our exterior chalkboard. Below, you can find pictures of both outside chalkboards, and, step by step directions to how we made them. My husband, mother, and I made a bunch of other fun outdoor play spaces for kids; water walls, sand and water tables, a backyard sandbox, and an outdoor art table and mud pie kitchen. Click on each of the links to learn how to make your own! As mentioned above, we have made and used several outdoor chalkboards over the years. We love using a hollow wooden interior door, without a doorknob hole cut into it, to make an outside chalkboard because it’s an easy DIY backyard project. All you need to do is paint the hollow wooden door with outdoor chalkboard paint, and hang it up, or position it on your patio or in your backyard. 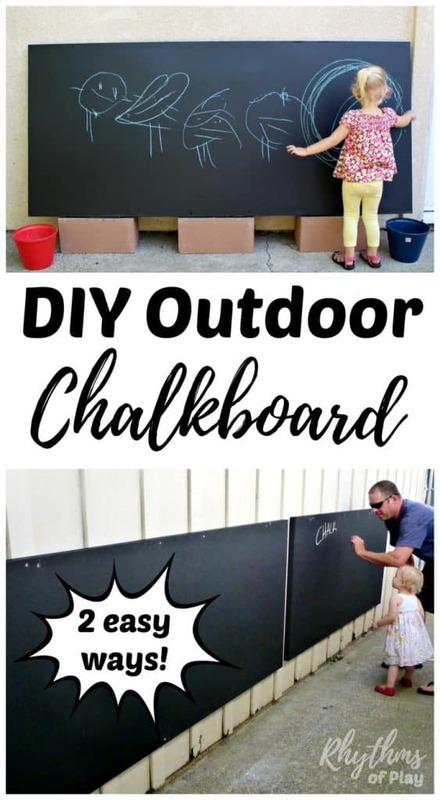 Follow the step by step directions below to make your own outdoor chalkboard! Update: The original outdoor chalkboard that we made lasted 6 years before we felt the need to replace it. It was heavily exposed to the elements and we never covered it so the wood became slightly warped and delaminated over time. The outdoor chalkboard paint never peeled or delaminated because we put on a fresh coat every 6 months to a year. After 6 years, however, we decided it was time for a new outside chalkboard so we made a new one just as easily as the first! A hollow interior wooden door without a doorknob hole cut into it. We found ours used at ReStore by Habitat for Humanity — not affiliated. 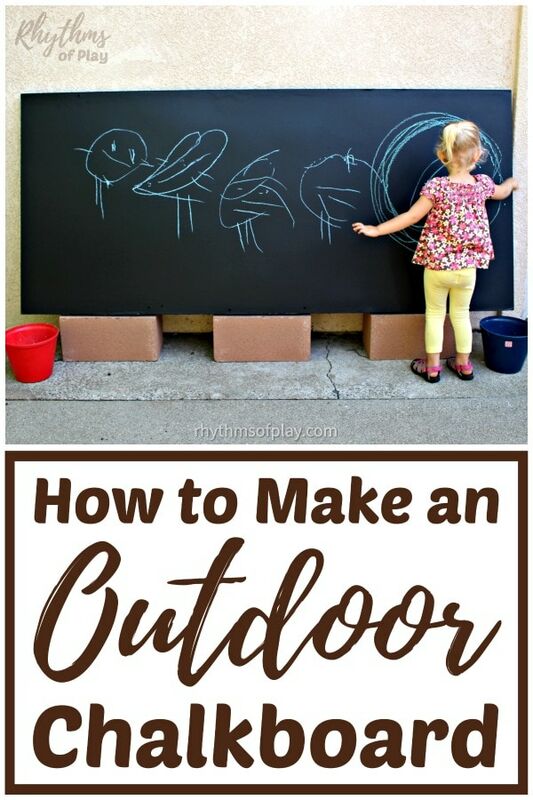 Follow the step by step directions written below to make a large exterior outdoor chalkboard for kids to put in your backyard, or, on your patio. Find an area large enough to paint the hollow wooden door. 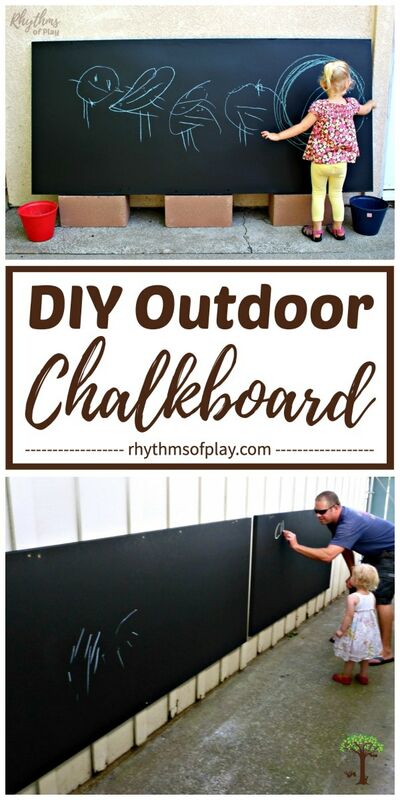 Place a tarp or an old sheet underneath it to protect the area you will be working in to paint your DIY outdoor chalkboard for kids. Use a paint roller with a smooth finish to paint at least one coat of chalkboard paint onto the door. Use long smooth strokes and work quickly – it gets tacky. Allow outdoor the outdoor chalkboard paint to dry. We found the hollow wooden door that we used at ReStore by Habitat for Humanity (not affiliated). The previous owner had used it to paint a sign and then donated it when they no longer needed it. We thought it was a would make a wonderful exterior chalkboard for our new patio! Since the wooden door that we found already had a base coat of paint applied, we only needed to apply one coat of outdoor blackboard paint to it. We have learned that starting with enough blackboard paint to cover the blackboard is fine. It’s better to save the paint, and put on a fresh coat every few months. Our little girl loves to do projects with her daddy. For more information about how we are raising a self-sufficient kid, have a look at these 15 ways to raise a helper. Over the years we have discovered, and experimented, with 2 easy ways to put up an outdoor chalkboard. My husband and I made our first set of outdoor chalkboards to hang in a corridor between our garage and our house when we ran home childcare when our daughter was just a baby. It was called chalkboard alley and was filled with chalk drawings that all of the kids in our care made. I wish I had taken more pictures of them to share, but we made them long before I started this website, so I dug up all the old pictures I could to share with you. Later we moved and had to figure out a new way to put up our outdoor chalkboard. Find out how we did it below! We hung the first DIY chalkboard we made in a long corridor between our house and the garage. The walls were board and batten so we drilled right into the wood to hang it. No anchors needed. It is possible to drill into all surfaces with the right screws and anchors to hang your outdoor chalkboard. Ask your local hardware or home improvement store for help. The photo below was taken after we hung the two DIY chalkboards that we made for our home daycare. Over time it turned into a wonderful alley with chalk all over the chalkboards and ground for the kids to enjoy. Our current landlord would not allow us to drill into the wall in order to hang our DIY chalkboard. At first, I thought this meant that we could not have one, and then I came up with the idea of propping our outdoor chalkboard up on cinder blocks. It works great! Our daughter drew her family on the outdoor chalkboard in the picture above. From left to right: herself, mommy, daddy, grandma, and a big circle for all the doggies constantly running around — haha! Transform your backyard or patio with a DIY Chalkboard! As you can see, it’s pretty easy to make an outdoor chalkboard for kids. You don’t even have to hang it to make it work. Propping your exterior chalkboard up on cinderblocks works great too. For more outdoor fun, check out this awesome collection of outdoor activities for kids. Sand and Water Tables Kids Will LOVE! What fun! Does it hold up well to being outside in the weather all the time? We’ve been using the same boards for a few years now – just repainted – but I hear they can delaminate. I read the Martha Stewart has a trick for adding grout to paint to make chalkboard paint to make it better outdoors. I thought about including a link to it in this post. I will see if I can find it and add it later.